When Auto-Repeat is Enabled, Automatic Keystrokes or Automatic Mouse-Clicks will be sent every Click Frequency after the Begin Delay period. This is ideal for reading text, scrolling documents & browsing on-line information. During CrossScanner operation, you can select the selected Auto-Repeat Icon in the IconWindow. The FingerScan will indicate the available selection. Once selected, the operation depends on the Auto-Repeat Action. There are 2 methods and each has different features available when selected. When this method is selected, it operates by sending keystrokes (Down or Up). There are a few operational issues, which are noted below. After selection the Begin Delay timer begins. After this time has expired, a Down or Up keystroke occurs at the Click Frequency. This will continue until another CrossScan is started. Because downward scrolling is much more common, this feature is designed to use the Down Arrow Keystroke, except as noted. To begin Automatic Keys, select the Auto-Repeat Icon in the IconWindow. This will end the CrossScan and start the Begin Delay timer. Once this time has expired, a keystroke will be sent and additional keystrokes will be sent as set with the Click Frequency. To Stop this Automatic Action, a Click is required. After every Down Arrow selection, the Up Arrow will be available in the IconWindow. Select this icon to begin Up Arrow Keystrokes - otherwise, the Down Arrow will be made available at the next CrossScan. CrossScan, click and select the Down Arrow in the IconWindow. During the Begin Delay, click again. Now click to begin another CrossScan, then click and select the Up Arrow. This will start the Automatic Up Arrow Keystrokes at the Click Frequency. After selection and the completion of the FingerScan a Click will send a mouse click and start the Begin Delay timer. 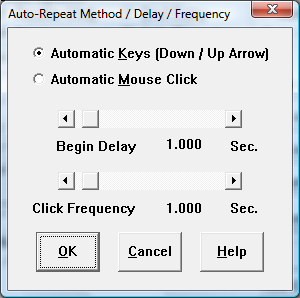 After the Begin Delay time has expired, a mouse click occurs at the last clicked position at the Click Frequency. This will continue until another CrossScan is started. This is ideal for operating scroll bars. You may add the Auto-Repeat Icon to the IconWindow in CrossScanner Setup, and select the Auto-Repeat action and set the Begin Delay time and Frequency under the Auto-Repeat button.